The Fly opens up with Vincent Price’s brother under an industrial press, his head and arm pulped into unrecognizability. Price (François) sees this and kind of screws up his face in one those “eww, yucky!” expressions like his brother has cooties or something. Then he gets the call all of us fear: his sister confessing that she squashed her husband because he had become part man and part fly! So François calls down to his club (yes, this is one of those movies where men have “clubs” that they hang out in and meet characters who advance the plot) and speaks to his friendly neighborhood police inspector. Now, why a wealthy industrialist like François would be going to the same club as some elderly cop is beyond me, and frankly doesn’t speak well of François’s social standing, but the story demands a kindly cop, so that’s what you get! François and the cop go to François’s sister’s house to find out what the hell she was doing making Steakum out of her brother. When they arrive, she’s acting kind of crazy and searching for a fly with a white head. Down in the basement lab is some wrecked equipment and there’s wiring everywhere and the first thing I think is that this dude is going to an awful lot of trouble just to get free HBO! Later on the crazy widow sits down with François and starts to tell her tale. I was a little let down at this point because the movie actually starts getting these wavy lines on the screen like they do on soap operas or Wayne’s World whenever they want to show us a flashback. I mean, now the tension is all gone. We already know her husband’s head and hand got smushed. We already know that the movie is called The Fly. We already know she’s looking for a fly with a white head, and we shortly will know that her husband also had a white head! But maybe it is not the destination that is important, grasshopper, but the journey. Okay, let’s see how this doofus got himself into this mess. Dr. Andre Delambre is one of those types who is consumed by pushing the frontiers of science. This of course involves using yourself in the experiment because you just know nobody else would be stupid enough to do it for you. First off he uses his gizmo to teleport a bowl and is pumped when it comes out on the other side of the room in one piece. He excitedly shows it off to his wife who flips it over and points out that the lettering on the bottom has been reversed. Isn’t that just like a woman? Then he tries it out on a newspaper and it is a success. Next up for teleportation is his pet cat, the improbably named Dondalay. After this trick, the Doctor and his wife are minus one pet cat. But you can still hear it meow! Neat! Then a guinea pig gets teleported and it turns out fine so the good Doc figures everything is AOK and decides to try it out on himself. What happens next has been used as a plot for one in four Star Trek (any series) episodes: transporter malfunction! How many times did we see this happen on Star Trek? You had people transported to the wrong place, wrong time, and wrong vibratory plane. You had people split into different personalities (remember Tom Riker? ), you’ve had people mixed up with other people, you’ve even had the wrong people show up. I always thought that with as many accidents as these gizmos seem to suffer that the Federation would had at least formed some type of committee to examine the safety of these things. The doctor in The Fly experiences a transporter malfunction that’s sweeter than any of those! It seems a common housefly was in the transporter with a common research scientist and when they were reassembled… I won’t reveal the shocking surprise but suffice it to say the doctor spends a good portion of the rest of the movie with a towel over his head and his hand in his pocket. His wife finally sees him and freaks out. She regains her wits and since she don’t speak Fly and his head that speaks English is in a spider’s web in the garden screaming for help, she devises a way to communicate with him. The two of them communicate back and forth with him either using his good arm to type or to write on a blackboard. The movie does a nice job portraying the doctor’s deteriorating humanity and his valiant effort to fight against it. His fly hand tries to stop his human hand from writing to his wife, but in a touching scene he is able to spell out in chalk that he loves her and she needs to drop an industrial press on his prickly head. So, the Fly gets squashed like the half-man, half-bug that he was and the wavy lines appear on the screen signaling the end of the flashback. The police captain says she’s nuts, but François has a thing for his dead brother’s wife so he thinks that maybe, there’s something to her story. A quick trip to the garden where a weird looking fly is about to be eaten by a spider is the clincher. The Fly is one of those films about the dangers of playing god and messing about with things you shouldn’t. The doctor was a decent man who was trying to invent something to help others, not pulling stupid stunts like Dr. Frankenstein with his “let’s dig up body parts to make a creature for no apparent reason” or that fat jerk Charles Laughton played in Island of Lost Souls where he was making his half-man, half-beasts to show up people in Europe that he didn’t like. That and Delambre’s struggle against the encroaching insect mind elevate this film above the standard giant bug movies of the 1950s. You actually cared a little about what was happening to him and believed his reactions to his predicament. The wife wasn’t as believable – scared into unconsciousness one instant, helping out her icky mutated husband the next like he only had a hernia or something . Vincent Price didn’t add much to things and was just there to listen to the story and facilitate the pointless flashback structure. 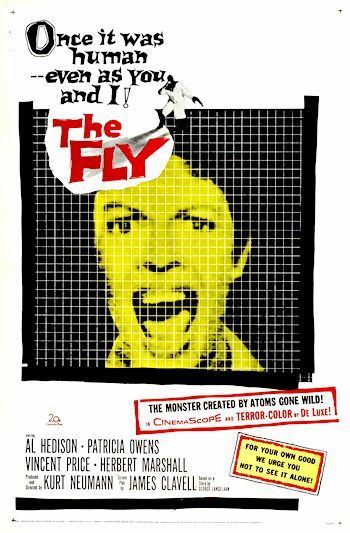 The Fly’s popularity was such that it also produced two little maggots called Return Of The Fly and Curse Of The Fly.